To be bluntly honest, the past few weeks has been a journey where Satan, and what feels like an army of his enemies, has been right on my heels! Through every weary day, I felt God reminding me of my word for 2014 and prompting me to “Be Still”. So, I have been putting into practice this command (sometimes with a whole lot of work on my part in needing to surrender) and have been writing down what God is showing me. Being still…being in His Word….applying the Word to my life gives me power to extinguish the fiery darts Satan sends my way and the enemy takes the hit…thank you Jesus!! For the next couple weeks, I am going to encourage you to camp out with me in Psalm 37:1-7. Next week, I am going to share with you some really great stuff I am learning with this passage, but first, I want you to do some digging on your own. Read over and over until God’s Word stirs in your heart. Spend some time worshipping God for who He is! As you read Psalm 37:1-7, pay attention to the nine (9) admonitions (command or action to take). I took a colored pencil and highlighted them in my Bible. We’ll talk more about these 9 commands next week! 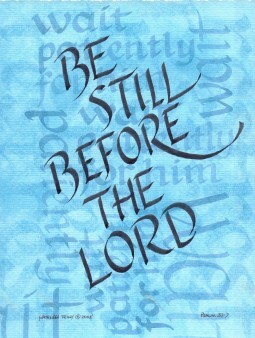 This past week I was doing some research and reading some articles on being still before God. I ran into this and thought I would take a moment to share it with you. When you are still before God….you know God. When you are still before God….you know God has your future in His hands. When you are still before God….you will understand yourself better. You get a glimpse of your life’s purpose through His eyes. When you are still before God…you realize your future is God’s memory. And there you can have peace. As you read through this passage in Psalm, I would love for you to share in the comment section how God is redirecting your heart in applying these truths to your everyday life!